Ok.. y'all know it. Blue is my favorite color. I love it, there's just something about the color blue, it's so calming to me, like a nice summer sky. 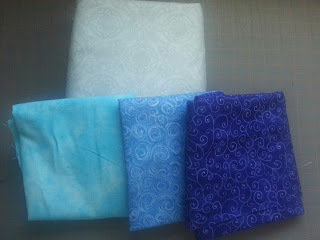 These are going to be going into a "Shades of Blue" Carpenters Star quilt. The bottom row is going to be the front of the quilt, and the back one is a blue-grey that will be the backing and the binding. Oh is this one going to be so much fun. And this one is another Shade of Blue top. 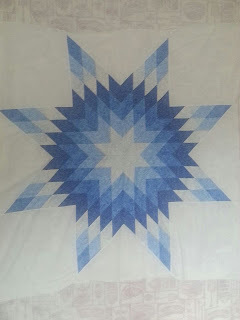 I've got to think about the border on it, and then how to quilt it. I'm thinking that I'll be quilting loops in each diamond, and then maybe some curved cross hatching in the triangles.. not sure on the squares yet. And I'm not sure on what border or borders I'm going to do just yet.